Dungeness Crab is one of the culinary delights of the Pacific Northwest. These large, impressive crustaceans take their name from the village of Dungeness near Sequim, WA, location of the oldest commercial shellfish fishery on the Pacific, and the place where Dungeness were first commercially harvested. 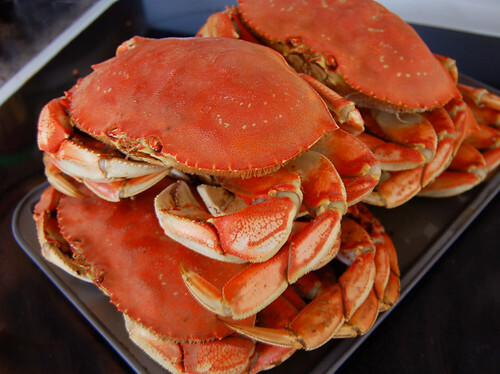 Dungeness Crabs have been celebrated at the Dungeness Crab and Seafood Festival in Port Angeles, WA, since 2001. This year, the festival takes place October 9 and 10. Expect to find live music, cooking demonstrations by some of the most outstanding chefs in the region, and of course, plenty of Dungeness Crab. Crab Feeds take place Friday Night (for those who can’t wait until the festival actually opens) and all day Saturday and Sunday. Dungeness Crab is delicious warm or cold. It is buttery and meaty and tasty no matter how it’s prepared. But crab, even Dungeness Crab, is best when paired with a beverage. May we suggest a glass of Washington State wine or cider?